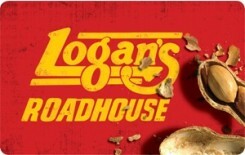 Earn 4.2 SB per $ when you buy Logan's Roadhouse gift cards at MyGiftCardsPlus, powered by Swagbucks. Don't dress up, just show up at Logan's® – a place where guests can come as they are, be themselves and make lifelong friends. Logan's is known for great, mesquite-grilled steaks, ice-cold longnecks, mouthwatering, made-from-scratch yeast rolls, and bottomless buckets of in-shell peanuts. The high-quality, moderately-priced menu features over 60 entrees including aged steaks hand-cut fresh on the premises, grilled chicken, fresh ground steakburgers, baby-back ribs, seafood, and specialty salads made from only the freshest ingredients.